Ever wanted to ask Jose Canseco about steroids? Interrogate TO about taxes? Maybe you’ve always dreamed of seeing Jim McMahon perform the Superbowl Shuffle live and in person. Have we got a show for you!!! Just click on your friend Coupon Puppet below to save 20% off Renegades at Caesars Palace tickets. Just be sure to enter RNCHAT20 into the Offer Code box when you choose your seats at Ticketmaster. Coupon Puppet was very excited to hear about this new Vegas show starring bad boys of sports Terrell Owens, Jim McMahon and Jose Canseco. Our excitement was tempered a tiny bit when we learned it is NOT a song and dance revue. Still, a roundtable discussion featuring three of the most colorful personalities in sports discussing their exploits on and off their respective playing fields is bound to be fascinating! Plus, the show is interactive: audience members get a chance to ask their own burning questions! We plan to ask Jose a bunch of trick questions to ensure it’s really him and that he and his twin brother Ozzie have not pulled a Parent Trap-esque prank on us all. Renegades at Caesars Palace plays at Cleopatra’s Barge at 8PM Thursday through Sunday, and currently has dates through April 29. Please note that the role of Terrell Owens will be briefly played by Michigan basketball legend Jimmy King February 15-18. Be sure to use our offer code to save 20% and see this new Vegas show at prices starting at just $49! Not for nothing, but Cleopatra’s Barge, the home of Renegades at Caesars Palace, might be one of Coupon Puppet’s favorite spots in all of Las Vegas. It’s got a great location in the heart of Caesars Palace. There’s almost never a cover charge, and the live music is on point- check out David Perrico and his Pop Strings Orchestra on weekends for a prime example. The eponymous barge is an actual floating stage/dancefloor, so it’s got the Vegas kitsch factor covered. And most importantly, it’s one of those unpretentious clubs where all sorts of people appear to be having a great time any night of the week. 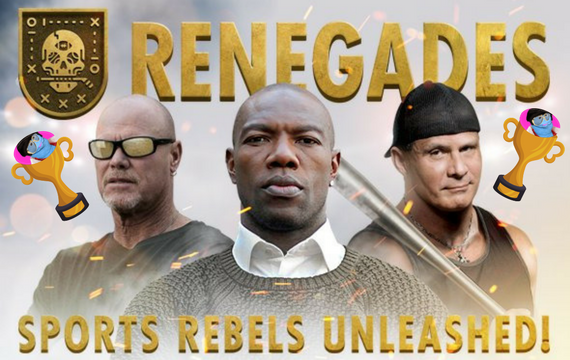 So we totally recommend you stick around after watching Renegades. Coupon Puppet Loves Finding You The Lowest Price On Renegades At Caesars Palace! O™" by Cirque du Soleil® at the Bellagio Hotel and Casino"